I overslept this morning intentionally and didn't roll out of bed until 8. It was a cloudy day but not raining so I still decided to keep on trying to walk around outdoors. I made my way to Leicester Square to check out the discounted tickets for the theater shows for tonight. I wound up buying a ticket for Jersey Boys, which I can obviously see in the U.S. as well (along with most of the other shows in the theater district here), but I thought it would be funny to see how Brits play the “Jersey” accent. I made my way south down Trafalgar Square, which was nice for a little bit of people watching. 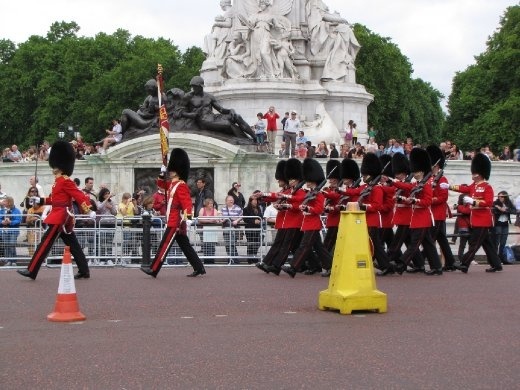 Then since it was close to 11 I made the trek to Buckingham Palace to watch the Changing of the Guard. I had read in my guidebook that it was really crowded and a haven for pickpockets, but I wanted to finish up my touristy stuff and I was close enough to the area that I thought I might as well go for it. I lined up randomly on the left side facing the palace and wound up standing for close to 30 minutes just waiting as other tourists filled in the other areas – especially right by the gates of Buckingham Palace. I couldn't see the actual guard exchange in front of the palace since that area is actually gated and I didn't want to press myself against the giant mass of people trying to get a good shot of inside. Basically my view was of the guards parading in on their horses with a brass section. There were at least 2 different guard parades, and then I suppose it takes a while for all the guards to be rounded up from all corners of the palace, because although they were playing sort of traditional marches coming in, once they were inside the gates the first song they played was John Williams' movie theme from Superman. I had assumed that it it was a super-serious affair and thought maybe I was mixing the song up, but there were some Japanese tourists by me and in between their chatting I caught the words, “Ohh, Superman!” By the time people got tired of standing around and left and I managed to get in front of the palace, the guards were playing “YMCA.” Quirky I suppose. I'm glad I got to see it but otherwise I think it is highly overrated to stand there with limited views for 45 minutes. It's crazy to think how this is performed every single day now and they have to block off the roads and deal with hundreds of tourists trying to climb up on statues or the gates to get a better view. I can't believe the palace is gated off like that though; I guess it's only open those few months when the palace is actually open for tours. I always thought I could be one of those annoying tourists failing to make the palace guard laugh. Thank you, Married with Children for giving me false hopes. When I finally escaped that tourist mass I made my way to Coventry Garden – a marketplace of shops, cafes and street performers. I found a pie shop (yay), where I ordered the traditional steak and ale. Not as good as I hoped it would be but I have 2 full days left here so that gives me a few more opportunities. There were some entertaining buskers, including a string quartet and a guy on a unicycle juggling 2 swords and an apple. If I had any room in my luggage for souvenirs, and if I was heading straight home after London I would have scoped the place out because there were some interesting shops, but I'm afraid that will have to wait for another trip. Since the day was still early I decided to hit the last outdoor place I could think of on my list of tourist to-do items in London, and that was Shakespeare's Globe Theatre – which is as close a recreation of the original theater as it could be. Since they were doing tech rehearsals for “Faustus” based on Christopher Marlowe's work, we couldn't take pictures again and instead stepped inside to watch about 15 minutes of the tech rehearsal while we sat in silence. I'm not familiar with the play, but the scene they worked on dealt with making a deal with the devil and the guy being tempted by a seductress – definitely not with family-friendly gestures – and they kept on rehearsing that bit over and over and over again. The actual theater layout looks pretty interesting. They recreated the original as much as they could, such as instead of using real Italian marble for the pillars, they used wood and then painted it to look like marble. I think it would be interesting to watch a show there, but I would definitely sit in the covered section. The “groundlings” are the cheapest tickets at 5 pounds each, and they are standing tickets only, with no roof to protect from the weather. Finally I headed to Leicester Square to try to find something to eat before my show, which was a bad idea because I wound up circling the area right by Charing Cross Street multiple times where the theater was so I wouldn't be late. I thought I should attempt to look somewhat nice so I had to ditch the Keen sandals and the tennis shoes and put on some black dress sandals, but that also meant I didn't want to walk far so my food choices were limited. I finally wound up picking this random bar/bakery/restaurant called Pompidou. The virgin drink was good but the food was definitely not. But I got out in time to catch the show so I guess I can't complain too much. Then I found out that the tkts guy sold me a ticket for tomorrow night. I was already in the theater and didn't realize until someone else tried to sit in my seat (they didn't notice at the front door either). The usher told me to follow him but that it was going to be difficult since the show was starting in one minute. I thought they were going to tell me to just come back tomorrow, but thankfully he just radioed it in to the ticket office that he needed one seat, and there was one available so I wound up getting a better seat than what I had originally. Ah the bonuses of traveling solo! Jersey Boys put me in a really good mood, and yes from what I could tell they were able to pull off the stereotypical Jersey accent pretty well for the most part. I think the songs just put me in a giddy mood and I couldn't stop grinning once they started going through the big hits like, “Sherrie, Baby,” and “Big Girls Don't Cry.” It was nice to just sit there for 3 hours and not have to worry about what I was going to do for the rest of the day or stress about anything else. I could just pretend like I was a Londoner. During intermission I also had a Pimms – this fruity British alcoholic drink – and since I drink about 1-2 times a year and I pretty much chugged it like it was glass of water on a hot day, I was especially giddy during the 2nd half of the show. Now I have Frankie Valli and the Four Seasons stuck in my head the rest of the night, which isn't a bad thing. Tomorrow I'm planning to wake up late and then maybe finally getting a “hearty” English breakfast with bangers and mash and whatever else unhealthy food goes with it. I've been making good use of my Cliff bars for whole grains and fiber for breakfast but I think it's time to splurge a little. And then I'll also finally head to the British Museum. I feel pretty good with what I've seen so far; if I had to fly back now I wouldn't regret missing out on something, so I think the next two days will be at a slower pace and maybe my legs will finally get some time to recover from being sore from walking around so much.